Ogre and I are in the holiday spirit earlier than usual - we even put our Christmas tree up before December. Granted, we finished decorating it a mere hour before midnight struck on the 1st, but it still counts! Receiving an early gift from Jacqui of Daisy-Doo certainly sparked the spirit this year. 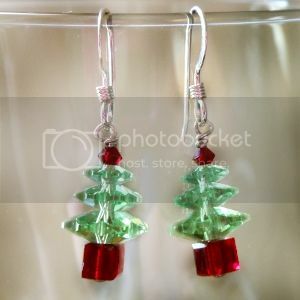 These crystal Christmas tree earrings are an elegant addition to my holiday jewelry collection. They are a tasteful alternative to the more garish festive earrings that usually abound at Christmas parties! Each Christmas tree is strung with 5 Swarovski crystals - Siam Red for the base and top with Peridot green for the tree branches. The height of each tree is approximately 3cm and the width is 1cm. And oooh, how they sparkle and shine so brightly! I love these, they're so delicate (unlike many other christmas themed jewelry)!